Bench top 0.8A Variac transformer with high efficiency and no waveform distortion. Rated at 220V input with an output voltage of 0-250V. Maximum output current is 0.8A. 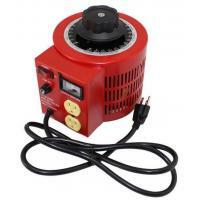 This auto transformer is VERY popular for home coffee roasting machines. It allows much greater control of the temperature of the roasting of coffee beans. They can also be used in science labs, audiophile (Great for old Tube Amplifiers), Science lab, hobby, film & video lighting applications. The auto transformer or Variac (both terms apply to the same item) is used to adjust the AC power either up or down. For instance if the AC power from the power company was 125 VAC and your application required 90 VAC, then this Auto transformer could be plugged in and the AC voltage could be adjusted to the desired level. It does not convert AC to DC. It is AC in and AC out. Also, the unit will not affect the cycle rate from the power company. If your power system is providing 60Hz, the Variac-auto transformer will not change that. This unit is rated up to 0.8 Amps or 0.2KVA. Note: Variacs are not compatible with most GFI (Ground Fault Interrupter) wall outlets. We have found that the inductive load that the Variac represents is not compatible with most GFI circuits and they will trip the breaker.